Designer styled laundry bag that can last throughout college! Dorm Co. Tip: Your dorm decor is all of your dorm room stuff! If you can't make laundry in college fun, you can at least make it look good! 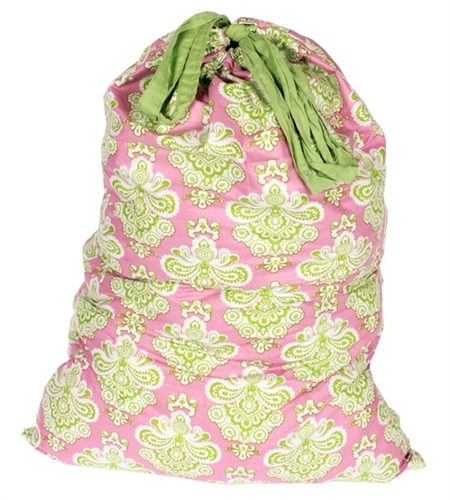 To do so, you'll need a cute laundry bag for college girls like this Istanbul Pink/Lime - College Laundry Bag. Dorm laundry bags are usually less bulky and just look better than hampers. 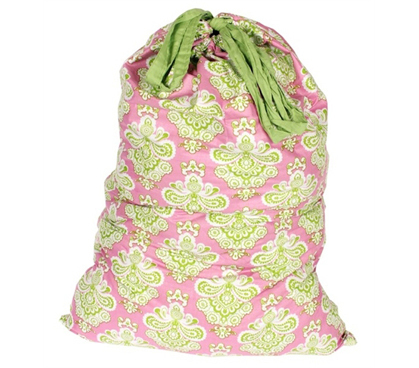 The great-looking pink and green patterns on this college laundry bag are just what's needed to bring a touch of style and design to the not-so-fun task of laundry in college. Since this college laundry bag is made with cotton-lined material, it'll be durable enough to last you throughout college, meaning it's worth selecting a pretty laundry bag if it will be with you for so long. Should this laundry bag for college start to appear rather used after a year of holding dirty clothes, you can even pop this bag right in the washing machine for its own wash. You certainly can't do that with a dorm laundry hamper, and even some other types of laundry bags. It's true that it appears that there's not that much difference between your basic laundry bags. But look more closely. This wash bag has great style, drawstrings, soft material, and it can be washed easily. What more could you ask for in a college laundry bag?